...that it was not feasible to do a spinal tap before and after someone exercised to look for a flood of endorphins in the brain. Researchers could detect endorphins in people’s blood after a run, but those endorphins were part of the body’s stress response and could not travel from the blood to the brain. They were not responsible for elevating one’s mood. 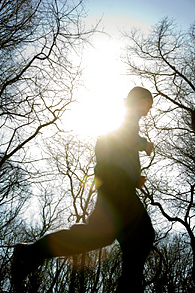 So for more than 30 years, the runner’s high remained an unproved hypothesis. Boecker et al. used a synthetic opioid labelled with fluorine isotope ([18F]FDPN), visible in positron emission brain scans (PET scans), which binds to brain opioid receptors. Less of this compound was found bound to several brain sites important in mood control after running, because those site had become occupied by endogenous opioids during the running. The current affective states before and after running as well as before the resting PET scan were evaluated with Visual Analog Mood Scales - subjects rated different items (sadness, tension, fear, anger, confusion, fatigue, happiness, and energy. This yielded the VAS euphoria scale referenced in the figure. VAS ratings of euphoria are inversely correlated with [18F]FDPN binding. Here is that figure, followed by the full abstract from the article. Figure - Correlation of opioidergic binding in runners with VAS ratings of euphoria. 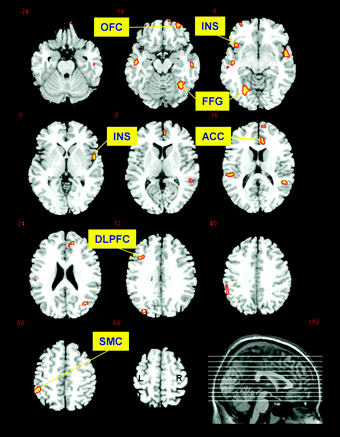 Statistical parametric maps of the regression analysis (regions where VAS ratings of euphoria are inversely correlated with [18F]FDPN binding) in standard stereotactic space (Montreal Neurological Institute [MNI] space) are overlaid in color on axial slices of a skull-stripped normalized brain. The runner's high describes a euphoric state resulting from long-distance running. The cerebral neurochemical correlates of exercise-induced mood changes have been barely investigated so far. We aimed to unravel the opioidergic mechanisms of the runner's high in the human brain and to identify the relationship to perceived euphoria. We performed a positron emission tomography "ligand activation" study with the nonselective opioidergic ligand 6-O-(2-[18F]fluoroethyl)-6-O-desmethyldiprenorphine ([18F]FDPN). Ten athletes were scanned at 2 separate occasions in random order, at rest and after 2 h of endurance running (21.5 ± 4.7 km). Binding kinetics of [18F]FDPN were quantified by basis pursuit denoising (DEPICT software). Statistical parametric mapping (SPM2) was used for voxelwise analyses to determine relative changes in ligand binding after running and correlations of opioid binding with euphoria ratings. Reductions in opioid receptor availability were identified preferentially in prefrontal and limbic/paralimbic brain structures. The level of euphoria was significantly increased after running and was inversely correlated with opioid binding in prefrontal/orbitofrontal cortices, the anterior cingulate cortex, bilateral insula, parainsular cortex, and temporoparietal regions. These findings support the "opioid theory" of the runner's high and suggest region-specific effects in frontolimbic brain areas that are involved in the processing of affective states and mood.